@dirt this is such a wonderful piece and seeing it finished after that first deer is wild, I had NO idea it was going to end up a whole magnificent thing like this!! @scribbler yeah, we had a little fun, didn&apos;t we? @dirt bad joke. any time I see 4 panel anything my brain tires to interpret it as a meme. That's just me though. 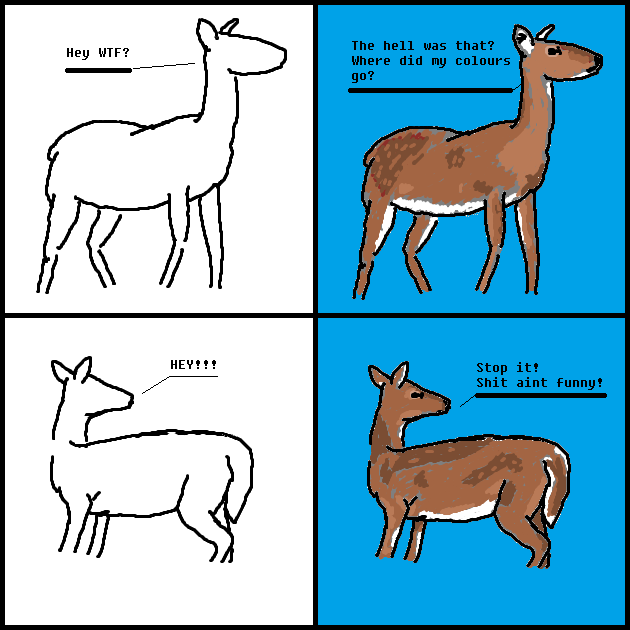 Your deer are cute! @dirt but really though these are really cute I love it!! @dirt claire!! i love this!!! @citrustwee thank you thank you thank you!!!!! @toilet thank you! Not a comic, but still fun to make! @dirt looks really good! I’m impressed.